Paying for a top college basketball recruit can be expensive. Documents from the FBI’s investigation into the shadowy world of college basketball uncover a web of corruption, and no single transaction is more interesting than the general negotiations around how much players get paid and who pays them. In a just world, the players would simply get paid for their labor up front; under NCAA regulations, they have to go through a series of middlemen. Look no further than the all-encompassing shitstorm Arizona is in the midst of for a perfect example of how this sausage is made. In the FBI report, two Adidas employees discuss an assistant coach from “University-4” reportedly preparing to offer “Player-12” $150,000 for his signature. The documents make it very clear that “University-4” is Arizona, since the school is represented by Book Richardson, who was arrested and will soon be fired in order to make it seem like Arizona has successfully quarantined a rogue actor. After some sleuth work in the Miami section of the report, State Of The U figured out that “Player-12” is almost certainly Nassir Little, a five-star wing from Florida who is considered one of the best players in the country. Until recently, Little seemed to be headed to Arizona. However, he’s since tweeted (and deleted) that he’s reopened his recruitment, despite him never having committed to any school in the first place. The now-former director of his AAU team, Brad Augustine, was arrested in the initial FBI sting, and documents show Augustine allegedly working with agent Christian Dawkins and two Adidas employees to try and steer Little to Miami. Augustine is accused of taking Adidas bribes and then using his access and position to get his best players to play for Adidas schools. Arizona is a Nike school, and the $150,000 figure came out as the four men were talking about the offer they allegedly needed to beat. Little’s family and Augustine have denied asking for or accepting any money, and while the $150,000 figure and the number of people involved are eyebrow-raising, Little’s particular case isn’t even the most damning part of the FBI file. While the school has initiated firing proceedings on Richardson and released a short statement acknowledging the investigation, Miller has maintained his silence. Arizona has postponed their media day and none of the school’s statements mention or offer support for Miller. His silence is understandable, but he has a lot to answer for. Richardson has been with him since 2007, when Miller coached at Xavier, which is longer than any other assistant. Together, Miller and Richardson have consistently pulled in some of the best recruiting classes in the nation year after year, and they even had the best 2018 class in the nation before the FBI scandal broke. More Arizona coaches besides Richardson are mentioned in the FBI report, including former associate head coach Joe Pasternack, and although nobody else has been arrested yet, the idea that Richardson was acting as a rogue agent is highly unlikely. No matter how vociferously Jay Bilas defends Miller, the FBI report didn’t indicate that Richardson was a rogue actor. It exposed a system of agents and shoe execs working in concert with college coaches to route players to the schools they want them to go to in exchange for money. Making Richardson out to be the only bad apple is an understandable defense, but it doesn’t align with how recruiting has been shown to actually work. 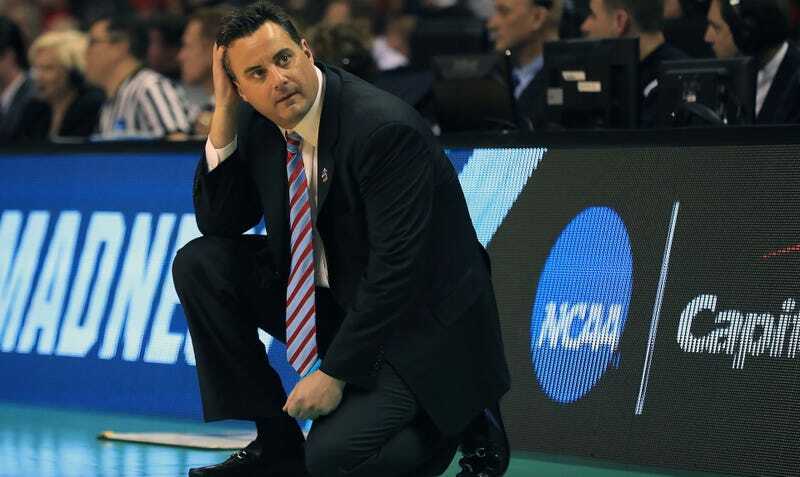 Even if this doesn’t cost Miller his job, it will cost the program recruits and credibility. Quinerly will probably not be eligible to play next year, and why would an incredible player like Little Shaq want to wander under this particular dark cloud? The deep irony here is that while players should get paid, in this system, they are getting paid. The problem—a shadowy network of middlemen and grifters who can abuse the NCAA’s repressive gray market for talent to enrich themselves, which turns the recruiting scene into the shadiest possible place—would be resolved by abolishing the institution that creates the conditions in which the problem exists. The FBI is enforcing rules that exist for no other reason than to theoretically require FBI enforcement; without them, there would be nothing to see here but people doing business.